…Okay, this time around, I’m going to be talking about the world map a little. This may seem strange, having an entire devblog post about the world map of a game, since it’s just a fancy menu. But there are some interesting things about the world map that reveal a little more about the nature of the game, and also I just want to tease you with some neat pictures. So the game is split into various regions (think of them as “worlds” or “levels”). 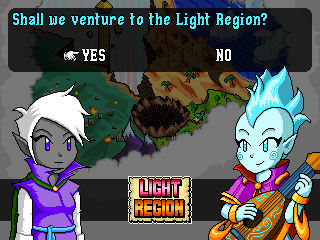 At the onset of the game, there are three unlocked regions to select from. The player can choose any of them to begin with, and may proceed to progress through all three of them in any order. 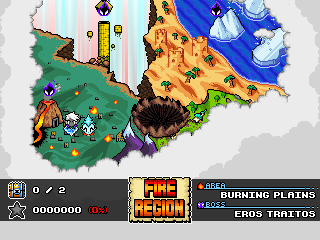 These regions are the Fire Region, the Water Region, and the Light Region. Each one is a part of Arc’s homeland that has been corrupted by the enemy, twisted into unnatural shapes befitting of their new, evil masters. A static screenshot of the world map. A HUD at the bottom of the screen shows some stuff about the currently selected region. At the left side, you can see how many super secret treasures you’ve found in the region (there are two in each region… I’ll explain them some other time) and your completion score. The star symbol changes depending on whether you’ve completed the stage (silver) or aced it (gold). The right side of the HUD describes the area and the terrible boss lording over it. An animated render. Note that some colour details are lost in the GIF. Needlessly communicating by verse, as a bard is wont to do. Sarabelle may be sarcastic, but this is pretty much video games 101. 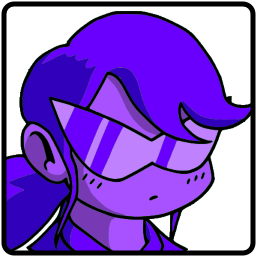 Arc is not amused. Arc is never amused. If you choose “no” and come back, you can skip the dialogue. Regions may be revisited in order to boost scores, to find collectibles, or just for the fun of it, as stage layouts will change on each run. If anybody is interested in the technical side of things, I’ll go into a little detail here: The cinematics in these sequences are dynamic, with many independently-moving parts. For example, the mouth movements are actually rigged to the text. It’s a subtle thing that I don’t expect people to consciously catch, but it makes the animations seem more fluid, like a cartoon. Basically, the mouths open and close when certain letters or letter combinations appear. I could go into more detail and have a greater range of motion for the mouths, but I want to keep it simple, like a 90’s video game or cheap anime. Another neat little thing like this is that the text will be rigged to “voices”. Don’t worry, they’re not actual voices. Like many games with text-based dialogue, the appearance of each letter is accompanied by a repeated, sort of “blippy” sound. These sounds will be different for each character, and will even have a different range of pitches. That’s the idea, anyway. The great thing about this dialogue system is that, now that it’s finished, I can reuse it in the rest of the game as well. Encounters with bosses or NPC’s won’t involve the big portraits of the world map; rather, I’ll implement smaller, traditional square portraits with varying expressions as needed for each character. I don’t have anything like this prepared to show off at this time, though. Such are the fruits of my recent labour. That’s all I’m going to talk about for now. If you have any questions or comments or criticisms, please leave them below, or on social media if that suits your fancy. I’ll be sure to answer or address them… unless answering will spoil too much.